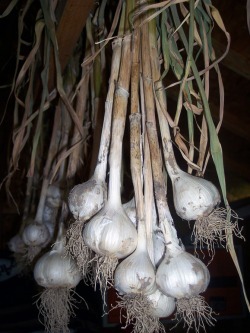 Home > Garlic Farm > Fun Facts about Garlic! April 19th of every year is national garlic day. Garlic is actually considered both a vegetable and an herb. Garlic has been used medicinally for thousands of years since ancient Greek and Roman times. Garlic is believed to ward off heart disease, cancer, colds, and flu. The consumption of garlic lowers blood cholesterol levels. and reduces the buildup of plaque in the arteries. The majority of garlic (90%) grown in the United States comes from California. Egyptian slaves built the pyramids on a diet of garlic, bread, and water. In medieval times, garlic was regarded as an antidote to drunkenness and overeating.